Rambling Through Parenthood : Secret Lamb Biryani Recipe Revealed! 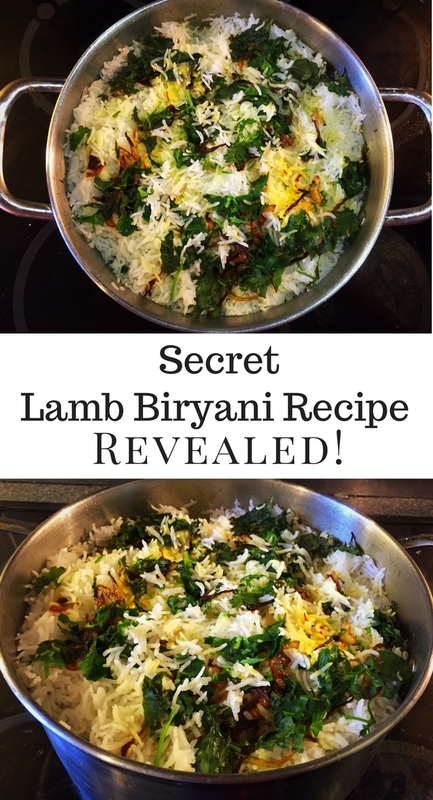 Secret Lamb Biryani Recipe Revealed! Biryani has long been considered the meal of the Nawabs – princes of ancient India. The recipe was a closely guarded secret, passed along from one generation of royal cooks to the next by word of mouth alone. My husband, M, loves a good lamb biryani and tried in vain to find somewhere that serves an authentic version. In the end, he decided to re-invent the recipe in our kitchen. We now have a tried and tested lamb biryani recipe that is a firm family favourite. M loves to make it. His friends and family love to eat it. After some persuasion, M has decided to reveal the secret to his lamb biryani. 2 teaspoons of Biryani Masala powder – either shop-bought biryani masala or home made. Here’s how I make mine. 3 tablespoons coriander seeds, 2 tablespoons sesame seeds, 1 teaspoon shahi jeera, 2 tablespoons poppy seeds, 2 inch cinnamon stick, 4 green cardamom, 2 star anise, 1 bay leaf, 6 cloves- dry roast each individually until aroma, grind to fine powder, sieve and store the powder in an air-tight container, can be used for several months. 1. Cut lamb into 2 inch pieces, I prefer to buy lamb with bone in but can use boneless. Mix together all the ingredients for the marinade, add it to the lamb and let it marinate overnight. Remove from fridge 2 hours before cooking. It is important to marinate the lamb to allow the flavours to soak in and allow the lamb to tenderise. If you are in a hurry, you could add meat tenderiser and marinate for 30 minutes but the flavours are not the best. 2. Deep fry finely sliced onion as suggested. If the onions turn dark brown, discard them as they will not taste nice and make a fresh batch. 3. In a broad based pan, add 4 tablespoons oil and temper with spices on medium heat. Fry for 1 minute. Add half the finely chopped mint and coriander and sauté for 30 seconds. Add the marinated lamb and half the fried onion. Cover the pan and let it cook on a medium flame stirring occasionally until the lamb becomes tender and the gravy becomes thick and almost sticks to the lamb. It is important for the gravy to be thick or the flavours will get diluted. 4. Wash rice in tap water at least 2 times, let it soak for 40 minutes. 5. To cook the rice, bring 2 litres of water to the boil in a large stock pot. Add salt to the water prior to adding the rice until the water tastes salty. Immerse the muslin spice bag in it for at least 5 minutes before adding the rice to allow the flavours to infuse. Add the rice and cook till almost cooked, but is still al dente. Drain the rice in a colander. Remember the rice will continue cooking so you need to work quickly otherwise you will end up with mushy rice. 6. Put the cooked lamb in a heavy bottomed vessel ( I use a stockpot with a flat lid). Layer it with half the rice. Add half of the remaining coriander, mint and fried onions. Add half of the saffron milk. 7. Add the rest of the rice for form another layer and then the remaining coriander, mint, fried onions and saffron milk. 8. Add 2 tablespoons ghee. 9. Add rose water ½ teaspoon. This is entirely optional. 10. Cover the pan with a tight fitting lid. It is important to maintain a tight seal. I put weights on the pan. 11. Cook on medium heat for 15 minutes. Be aware that the lamb might stick to the bottom and burn. If you smell burning, take off the heat immediately. This lamb biryani is not a quick-fix meal. It is a labour of love. The flavours in each mouthful make it worth the time and effort. I find it an excellent way to include red meat into the family’s diet. Our six year old loves eating it too and often asks his Daddy to make it, so that it has now become a staple in our meal plans. Red meat, in moderation, is as essential to a healthy balanced diet as any other food group. It is a good source of iron, zinc, B vitamins, selenium and potassium – essential ingredients for the healthy growth and development of children and maintenance in adults. How do you like to serve red meat in your home? I’d love to know in the comments below.